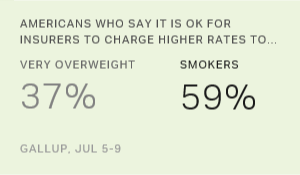 WASHINGTON, D.C. -- Many more Americans say insurers would be justified in setting higher health insurance rates for smokers (59%) than for those who are significantly overweight (37%). That gap has been evident each time Gallup has asked these questions. These latest data were collected July 5-9 as part of Gallup's annual Consumption Habits poll. 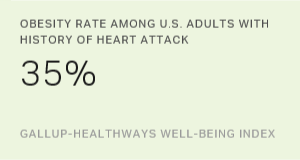 Slightly fewer U.S. adults endorse higher rates for these individuals now than when Gallup first asked the question -- in 2003, 65% said higher rates for smokers would be justified and 43% felt the same about significantly overweight individuals. Much of the decline in perceptions that higher rates for smokers are justified has been along political lines. While Republicans and independents hold similar views now to what they did in 2003, Democrats have become significantly less likely to find this justifiable -- dropping from 64% in 2003 to 55% today. 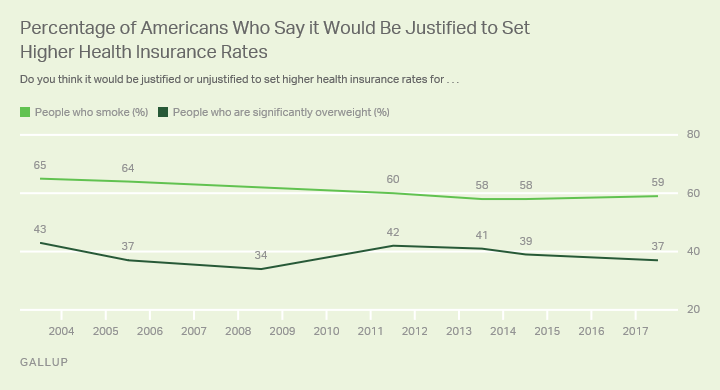 Similar to views on insurance rates for smokers, Democrats have become less likely to say higher insurance rates for the significantly overweight are justified since 2003 -- 42% then compared with 27% today. Meanwhile, there has been no meaningful change among Republicans and independents. 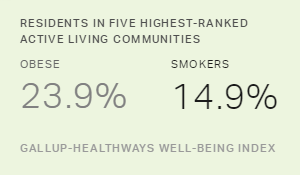 Among U.S. adults who report that they have smoked cigarettes in the past week, 42% say it is justified to charge smokers higher rates for insurance, slightly higher than the average 36% across Gallup's trend. This compares with 63% of those who do not smoke. Gallup asks Americans to categorize themselves as very overweight, somewhat overweight, about right, somewhat underweight or very underweight. Fewer than four in 10 Americans who describe themselves as "overweight" or who say their weight is "about right" or "underweight" say it is unjustified to charge significantly overweight individuals more for health insurance. Americans are slightly less likely now than a decade ago to say it is justifiable to charge smokers more for health insurance, but a majority still feel such a move is appropriate. Such policies might not benefit the overall insurance pool, however. A study by the Yale School of Public Health found a provision in the Affordable Care Act allowing insurers to set higher rates for smokers backfired. The provision ultimately discouraged many smokers from signing up for insurance and did not prompt them to quit. Regardless, Americans support charging smokers more. Americans' views do not extend to a similar policy for the overweight, however. Americans are either more sympathetic to those who are obese or feel obesity poses less of a threat to healthcare costs than smoking does -- although smoking is on the decline, while obesity is on the rise. Workers who smoke cost the U.S. economy an estimated $278 billion annually in lost productivity due to absenteeism and incremental healthcare costs.